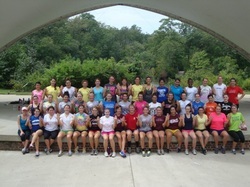 The sisters of Alpha Phi attended the William and Mary Ropes Course on Saturday August 30th to strengthen the bonds of sisterhood. Sisters were challenged in different team building activities, such as getting all of our sisters over a ten foot wall. Our chapter even beat a fifteen year old record by eleven seconds in an activity called "number punch." Towards the end of the day sisters moved onto the high ropes where they were pushed to face their fears and take on obstacles hanging many feet up in the air. Alpha Phi was excited to kick off the beginning of the fall semester with A*Phiesta! After the first few days of classes came to an end; Alpha Phi hosted an evening with great music, tasty snacks, plenty of laughs, and even a pinata. Be sure to come out to the rest of the events Alpha Phi will be hosting throughout the semester. On March 31st 2012 Alpha Phi hosted its annual formal at the Mariner's Museum. The theme for formal was "A Night Under the Big Dipper." All of our guests enjoyed a night of fun and dancing at the 2012 Alpha Phi Formal! The Theta Phi chapter of Alpha Phi welcomed 34 amazing women into our sisterhood on February 25th 2012. Congratulations to each and everyone of the newly initiated sisters of Alpha Phi! Alpha Phi hosted King of Hearts on February 6th and raised over $1200 for the Alpha Phi Foundation! 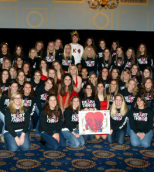 Andrew Bell, a brother of Pi Kappa Phi fraternity was crowned as the 2012 King of Hearts! In October, we hosted our 2nd annual Red Dress Gala to raise money for the Alpha Phi Foundation and cardiac care for women. In our event we raised over $2,200!